We’re about at the half-way point in these articles discussing the history behind modern Rolex watches. With that in mind, it might be time to discuss why Rolex uses the term “Oyster” for their water resistant watches. 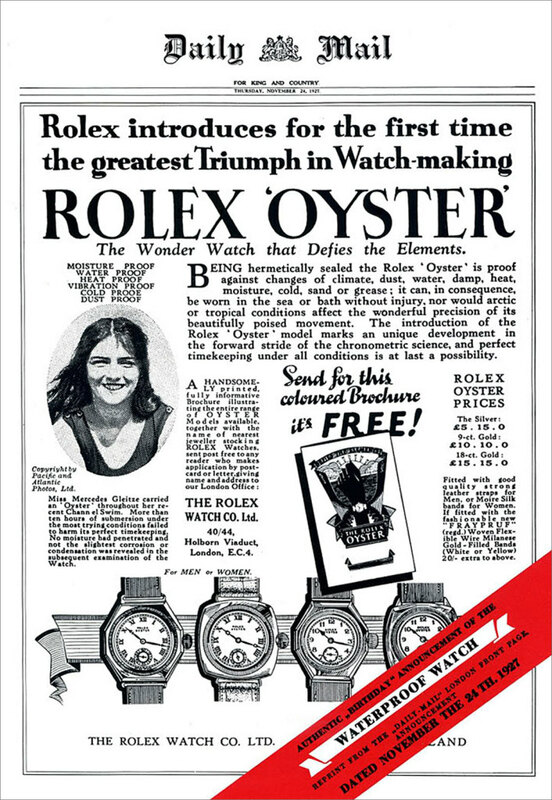 Rolex came out with the oyster case in 1926. The name came from the shellfish, which Rolex founder Hans Wilsdorf perceived to be extremely hard to open and thus effectively protecting the mollusk within from the surrounding elements. In the same way, the Rolex oyster system effectively sealed the case against water infiltration. Rolex accomplished this by a system consisting of a screw-in back, a screw-down crown, and a screw-down bezel (that’s the original function of the fluting on Rolex bezels, as a grip for a special tool). But what you may not realize is that the 1926 Oyster was not Rolex’s first attempt at such a design. In the early days, Rolex had their cases made by firms specialized in case making. The first several attempts at cases to protect the internals from dust were made by one or more of these unnamed firms. When WW I broke out they began sourcing cases in Britain. Dennison was the company tapped for this. Their first case for Rolex was delivered in 1915. distinguished itself in the muddy trenches of World War I. It went far in addressing the issues of packaging a movement inside a case utilizing a screw-down bezel, screw-down crown, and screw-down case back. Improvements continued for the next several years. And history records that, in 1926, Hans Wilsdorf filed a patent for a new case design. This is generally acknowledged to be the first Oyster patent. But Wilsdorf’s 1926 patent was in fact based on a 1925 patent which had been filed by Paul Perregaux and Georges Peret in La-Chaux-de-Fonds, Switzerland. When Wilsdorf learned of the design, he immediately saw its advantages. He negotiated for and purchased the Perregaux-Peret patent and filed his own in Britain. Soon after, he was producing Rolex timepieces with a case design based on the design. In foreshadowing what would become a Rolex tradition and modus operandi, Wilsdorf followed with patents for several improvements through the late 1920s and early 1930s. And in subsequent years and decades, the oyster case design gradually became the case design in which all Rolex watches were packaged. These days, the screw-down bezel has gone away, but the screw-down crown and case back are still integral parts of the Oyster water resistance system – and a part of every Rolex produced today. Ever wonder about the backstory of your favorite Rolex? Well, stick with us. This is the tenth in a series of posts featuring histories of significant Rolex models. In all, Rolex has introduced nearly three dozen models since 1950. Over the next several weeks, we’ll touch on each. You’ll find all the reference numbers connected with each model here.